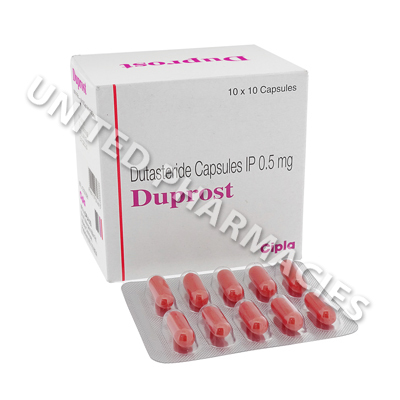 Duprost (Dutasteride) is prescribed for a number of uses. It is commonly used to treat BPH (benign prostatic hyperplasia), a condition which causes urination problems due to an enlarged prostate. Many male patients use this drug to treat hair loss, as it is considered by many people to be effective in helping new hair to grow in patients affected by baldness. 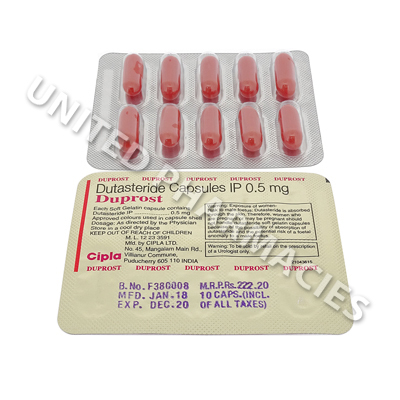 Duprost (Dutasteride) is prescribed for a number of uses. It is commonly used to treat BPH (benign prostatic hyperplasia), a condition which causes urination problems due to an enlarged prostate. This medicine helps to relieve these symptoms by reducing the size of the prostate. Many male patients use this drug to treat hair loss, as it is considered by many people to be effective in helping new hair to grow in patients affected by baldness. Duprost (Dutasteride) capsules need to be taken exactly as prescribed by your doctor. Adult patients treating an enlarged prostate are sometimes told to take it once per day. Generally, and improvement will be noticed after 3 months, however in some cases, it takes 6 months before the full benefits are noticed. Patients who take it to treat hair loss need to ask their doctor for the correct dosage. While you are taking this drug, you are advised to inform your doctor about any side effects you notice, especially if they persist or become more serious. However, you need to consult your doctor as soon as possible if you notice peeling of the skin, a discharge from the breasts, breast pain or any other severe reactions which have not been listed here. There is a slight risk that taking this medication can increase the chances of prostate cancer. You are advised to discuss the risks of treatment with your doctor. This medication is only prescribed for use in men, and is not used by women. In addition to this, male patients should avoid donating blood while taking this drug, and for at least 6 months after taking it. This is to ensure that no pregnant women are given blood which may contain this medicine. Always use Duprost (Dutasteride) as you have been prescribed by your doctor. Never self-medicate or change your dosage without first consulting your doctor. The correct dosage can vary depending on your health, medical history, and the severity of the condition being treated.